With the adoption of front-wheel drive as the mainstream power delivery system of choice, the semi-annual ritual of swapping snow tires has largely disappeared for most Americans. In many northern areas, all-wheel drive has become an increasingly popular choice when offered as an option. But as much help as putting power through all four wheels can be, it simply can't substitute for a good set of snow tires. Ultimately, grip comes down to four patches of rubber and if they're unable to make solid contact, the number of drive wheels becomes irrelevant. This became abundantly clear this past weekend while driving a new 2010 Subaru Legacy. The Legacy is a plush, roomy mid-size sedan with excellent outward visibility and Subaru makes an excellent symmetrical all wheel drive. Unfortunately, its all-season tires lacked traction. Read on after the jump for more. On dry pavement all-wheel drive can be a major boon by splitting the tractive workload and leaving the front wheels to take handle steering. In the snowy conditions we endured this past weekend, it can also help claw its way through the snow. However, most cars can put out more drive torque than the tires can transmit. That means it's not at hard to spin up all four wheels when accelerating, at least until the traction control kicks in. Now as much as we enjoy to exploit slip angles, it's best to keep the car within the limits of adhesion. 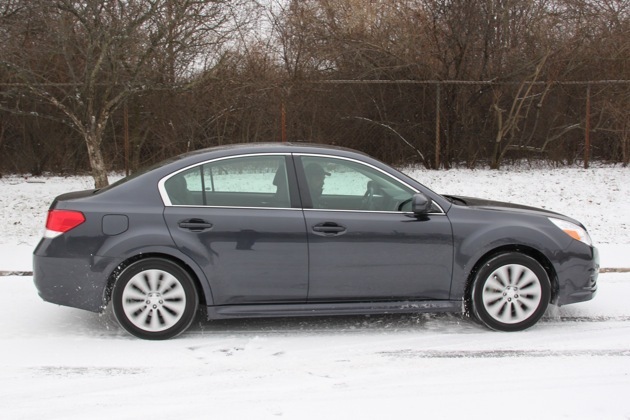 Lack of grip is a fundamental problem with all season rubber and all-wheel drive won't help you get around an icy corner or halt forward progress at a stop sign. Without traction, the Subaru still had trouble turning and it was pretty easy to get sideways before the stability management kicked in. The only solution to is fit tires that maximize grip in these conditions. All the major tire manufacturers produce winter tires and we highly recommend them to anyone living in areas subject to snowy winters no matter how many wheels are driven. The easiest thing to do is just by an extra set of rims and have the tires mounted. When winter arrives, put on the snows and stack the summer tires in the corner of the garage or basement, then reverse the process in the spring. It's money well spent, and certainly cheaper than body repairs and hiked up insurance premiums.